Another larger than life mosaic is complete! 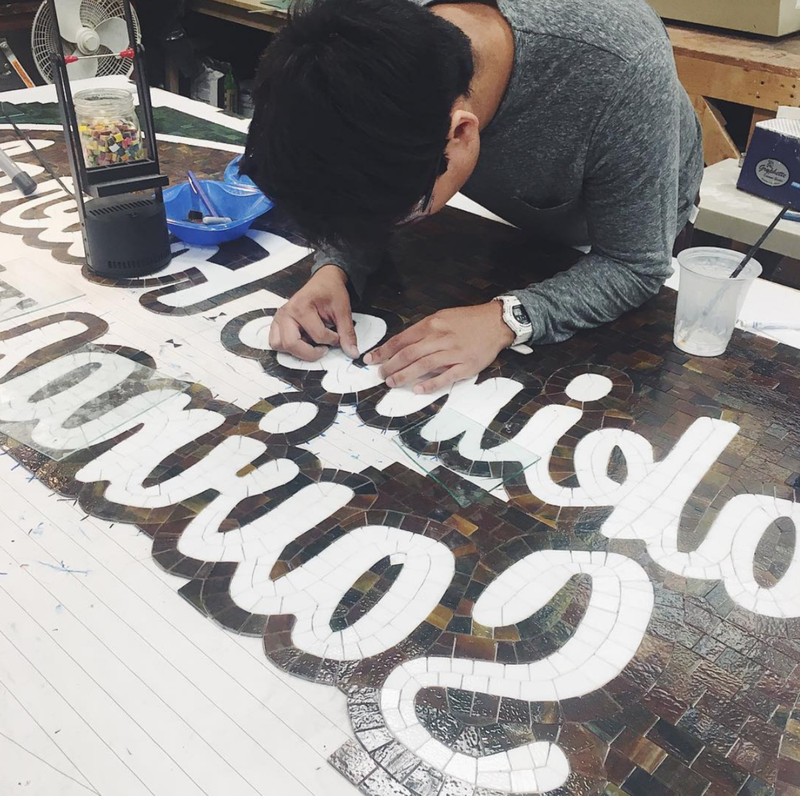 Tieton Mosaic has created a commissioned piece for Yakima Federal Savings, the first to be on display in Downtown Yakima. This piece has approximately 12,000 hand cut and laid tiles and is two-sided. The new sign is the first of its kind in downtown Yakima, and has been funded partially by a $5,000 grant from the Façade Improvement Grant Program of the Downtown Association of Yakima. The new mosaic sign will replace the current Yakima Federal sign on Yakima Avenue. While Tieton Mosaic has created and installed several signs in the city of Tieton, this will be the first of its kind in the city of Yakima. The sign has been custom designed to coordinate with the style and age of the building façade as well as those of the adjacent Larson Tower. Yakima Federal Savings and Loan Association has been in business operating in downtown Yakima since 1905, and has owned and occupied the building located at 118 East Yakima Avenue since 1957. In 1957, general contractor Gilbert Moen completed the façade update with stone panels and metal spires. Prior to 1957 the building was owned by Yakima Hardware. The North façade has had little updating since the office grand opening on November 25, 1957. As part of a separate project, restoration was recently completed to protect the existing stone panels on the North façade. The official unveiling of the custom sign is set for Thursday, August 16, at 11:30AM at the main office of Yakima Federal Savings and Loan, 118 East Yakima Avenue. Hope to see you there! What's next for Tieton Mosaic? Find out here!